You are probably already aware of the dangers of the ingredients in your preferred beverage - maybe you know that it contains artificial sweeteners that can be associated with headaches, dizziness, loss of balance, mood swings, nausea, memory loss, muscle weakness, blurred vision, fatigue, weakness, skin rashes and probably other symptoms that have yet to be discovered. Some of these sweeteners have already been shown to cause cancer when tested on animals - and then of course there is the acidifier that your drink includes - which, under controlled scientific studies has shown to contribute to erosion of tooth enamel and leach calcium from bones. 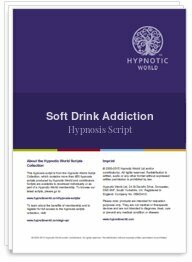 If you are concerned about your intake of soda and soft drinks then this hypnosis MP3 download can help you to overcome this addiction.